The psychedelic journey continues! Sun Department Records proudly present their second psychedelic compilation as free download. 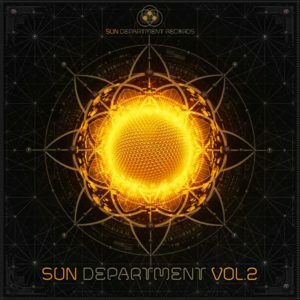 Sun Department Vol. 2, originally released in 2014, features tracks from their own label artists as well as exclusive and fresh tunes from guest artists. This sonic trip is like an intense party night starting with a mix of breathtaking full-on transitioning into floating psychedelic trance, twilight sounds taking you through the deepest night, and finishing with melodic frequencies to let the sun within your mind rise again. As we went back to the lab to do some music, the acid effect kicked in. We were finally able to see through the mind tricks and realized were we came from. All of it may have been triggered by the designers of the universe. It didn‘t come silent and slowly—it came with a big boom pow wow. The music we were doing at that time, it was the 5th of November, had a really high Qfactor right from the start. We closed our eyes and it almost felt like the ocular pressure increased. We opened them again and we were able to see the whole scenario in its real eternal beauty. MP3 Download | FLAC Download | WAV Download · Download count: 11,450. What a mind blasting release! Thanks again Sun Department! what a great compilation. the choices are great as each song doesn’t fits in quite nicely to the whole of it. no sore thumbs. face-melting comes to mind. Good stuff! This one really got me this time.